What role do novel protein diets play in treating patients with adverse food reactions? Novel protein: is it lamb, horse, duck, beef, chicken, eggs, or kangaroo? Actually, it could be any of the above. “Novel” simply means new and different. In this context, new and different means new to the animal eating the food—that is, the animal has no previous exposure to the ingredient. Novel protein diets are usually discussed when they relate to the diagnostic or therapeutic plans associated with adverse food reactions, such as allergy or intolerance. Food allergy is an abnormal response to food that is triggered by a specific reaction in the immune system and expressed by certain, often characteristic, clinical signs. The allergens in food—proteins that usually resist the heat of cooking, stomach acid, and intestinal digestive enzymes—are the components responsible for inciting an allergic reaction. They survive, cross the gastrointestinal lining, enter the bloodstream, and go to target organs, causing allergic reactions throughout the body. Mechanism of Action. Food allergy is a hypersensitivity reaction, which means the animal has been exposed to the allergen previously. At initial exposure, the allergen stimulates lymphocytes to produce the antibody that is specific for the allergen (Figure 1). This antibody is released and attaches to the surface of mast cells in different tissues of the body. The next time the animal eats that food, the allergen targets the specific antibody on the surface of the mast cells and prompts the cells to release histamine and other chemicals (Figure 2). Depending on the tissue in which they are released, these chemicals cause various signs of food allergy. Figure 1: Schematic representation of sensitization to foods in the gut mucosa: (1) Evading physical barriers, including epithelium-lining mucin, secretory IgA antibodies, and the cell epithelium, small amounts of food proteins can (2) be endocytosed by antigen-presenting cells (APC) and activate naïve CD4+ lymphocytes. 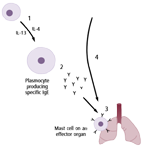 Figure 2: Schematic representation of an IgE-mediated reaction: (1) Antigen-specific, Th2-type lymphocytes will secrete IL-4 and IL-13, promoting specific IgE secretion by plasmocytes; (2) IgE will circulate in the serum and (3) bind to organ-resident mastocytes; (4) subsequent ingestion of the food antigen will directly provoke mast cell degranulation after binding of the antigen to mast cell–bound IgE antibodies. The complex process of digestion affects the timing, location, and particular signs of an allergic reaction. All signs occur within a few minutes to an hour of eating. A food allergy may initially manifest as redness and swelling of the mouth and throat, and possibly even difficulty swallowing and breathing. Then, during digestion of the food in the stomach and intestines, nausea, vomiting, diarrhea, and abdominal pain can develop. In addition, when the allergens are absorbed, enter the bloodstream, and reach the skin, they can induce pruritis and uticaria (the eosinophilic complex common in cats) and, when they reach the airways, asthma. The gastrointestinal signs of food allergy are those most often confused with signs of food intolerance. Food intolerance is far more prevalent, tends to be localized to gastrointestinal signs, and is triggered by several different mechanisms that are distinct from the immunologic reaction responsible for food allergy. Lactase deficiency (lactose intolerance) is a common food intolerance in animals and humans. Food intolerance also includes adverse reactions to certain compounds added to food to enhance taste, provide color, or protect against growth of microorganisms. Consumption of these additives can produce signs that mimic those associated with food allergies. A food elimination trial is the most important diagnostic tool in dogs and cats with suspected adverse reactions to food. In vitro and skin testing are not considered reliable for diagnosing food allergy. However, food trial testing gives no information about the underlying immunologic mechanism. Although food intolerance can be identified with an elimination diet and following challenge, most animals with adverse reactions to food are generally believed to suffer from food allergy when systemic signs reappear after challenge with their former food. The first step, and possibly most important part of a successful food trial, is a thorough and accurate feeding and diet history. To what sources of protein and carbohydrate has the animal ever been exposed? To what proteins, carbohydrates, food colorings, and additives is the animal currently being exposed? This includes not just the primary diet, but all treats, snacks, and table foods. Due to the complexity of modern pet foods, this information has become much more difficult to ascertain. A food elimination trial generally begins with discontinuation of all components of the previous diet and introduction of a novel protein “hypoallergenic” diet. However, the concept of a hypoallergenic diet is not entirely correct since it does not really exist. Food itself is antigenic (foreign to the body, capable of binding to specific antibodies), so the diagnosis and treatment of an allergy for a certain diet component consists of eliminating that component and switching to another diet with a different set of antigens and ingredients. A diet can only be hypoallergenic if the animal was not previously exposed to the food components. The ideal elimination trial diet should contain a limited number of new (novel), highly digestible proteins. Hydrolyzed protein diets (diets that contain altered proteins reduced in size to make them less antigenic) are also currently available commercially, although palatability of hydrolyzed proteins can be a problem. All additives should be avoided, the diet should be nutritionally adequate for the animal’s life-stage and condition, and the taste should be acceptable to the patient. Signs will resolve in an animal with food allergy if the animal ceases to take in any food; however, allowing the patient, especially a cat, to refuse the new food for an extended period is contraindicated and potentially more harmful than the original disease. Food intake must be monitored closely during the trial. As well, many pet owners believe that the new food is inherently therapeutic, rather than recognizing the diagnostic and therapeutic benefit of eliminating the source of all other potential allergens. The concept of an “elimination diet” must be made clear to the client. After the signs of food allergy or intolerance have resolved with the test diet, specific food components should be reintroduced individually. If added and fed for 1 to 2 weeks with no recurrence of signs, the next component can be added. This strategy is continued until recurrence of signs is associated with the reintroduction of a specific component, or a balanced acceptable diet is achieved without any recurrence of food allergy or food intolerance signs. Ideally, suspected ingredients should be added until signs recur and an allergy or intolerance to a specific component is confirmed; however, most owners are reluctant to alter a well-tolerated diet if it is balanced and complete, convenient, and acceptable to the pet. Changing a patient with a suspected food allergy from one brand of commercially available food to another is not a food elimination trial. The clinician must know each component and additive of the suspected offending food and the new suggested trial food. Although a pet food label says “salmon dinner,” salmon may not be the only protein component in the product; for this reason, convenient, commercially available pet foods may not be ideal for the initial diagnostic food elimination trial. In addition, protein sources that were once thought to be unusual have become popular additions to commercial pet foods to market the concept of a “better” food—for example, lamb and rice, rabbit and potatoes, and many other combinations are increasingly common. Many pet owners purchase what used to be considered hypoallergenic prescription diets to feed to all their pets, thinking that these unusual protein and carbohydrate combinations are in some way more digestible. This trend reinforces why an extensive and thorough dietary history is very important. Homemade diets are often used as initial test diets for dogs and cats with suspected food allergy or intolerance because composition can be more easily controlled. The homemade diet usually consists of 1 protein and 1 carbohydrate source. The food components most often suggested for dogs are lamb, chicken, rabbit, venison, rice, potatoes, and tofu. In cats, baby foods, deli meats, and cooked meats can often be used short term, with or without a carbohydrate source. An important drawback of most homemade diets is that they can be nutritionally inadequate for growth and maintenance. However, while a homemade diet may not be nutritionally balanced or complete, supplements are not necessary during the short test period. When a homemade diet is given during a prolonged time, it has to be balanced with essential nutrients. 1. A case of diet-related lymphocytic mural folliculilis in a cat. Declercq J. Vet Derm 11:75-80, 2000. 2. Double-blind evaluation of two commercial hypoallergenic diets in cats with adverse food reactions. Leistra M, Willemse T. J Feline Med Surg 4:185-188, 2002. 3. Food allergy in dogs and cats: A review. Verlinden A, Hesta M, Millet S, Janssens GP. Crit Rev Food Sci Nutri 46:259-279, 2006. 4. Mechanisms of food allergy. Eigenmann PA. Ped Allerg Immunol 20:5-11, 2009. 5. Results of a hypoallergenic diet survey of veterinarians in North America with a nutritional evaluation of homemade diet prescriptions. Roudebush P, Cowell CS. Vet Derm 3:23-28, 1992.